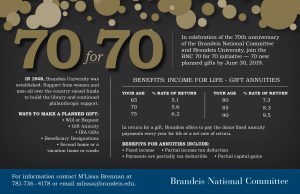 The purpose of this organization shall be to advance and promote the general welfare of and to give financial support and assistance to Brandeis University, Waltham, Massachusetts, and to promote the program of the BNC in the furtherance of said purpose. 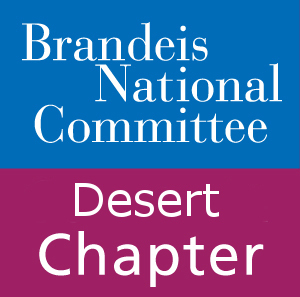 To carry out said purpose, the Chapter shall operate in accordance with the requirements of the Rules of Association of the Brandeis National Committee. Any person shall be eligible for membership in the Chapter. Any person may become an Annual Member upon payment of one year’s dues. The initial dues of a member who joins the BNC after April 1 shall be credited through the following fiscal year. Every member, regardless of membership classification, shall have one vote when an issue is brought before a general meeting. Membership dues are determined by BNC National Center and may be paid locally or directly to BNC National Office. Local payments are sent directly to National Office. The fiscal year of the Chapter shall be from July 1 to June 30 of the following year. The elected Officers of the Chapter shall be a President, one Vice President (or two Vice Presidents should the need arise) a Recording/Corresponding Secretary, a Treasurer, and a Parliamentarian, elected at the Annual Meeting of the Chapter in the spring. With the exception of the Parliamentarian, these Officers shall hold office for a term of one to two years. The Parliamentarian is nominated from among the Honorary Board Members. To provide continuity of traditional values and practices to the Chapter, this position is not subject to term limits. There shall be at least ten (10) Members-at-Large, selected by the president, for a term of at least two years. Members of the Chapter who would enjoy involvement in the operations of the chapter and who provide significant expertise, or Chairs of standing committees, should be encouraged to fill these positions. Each President of the Chapter, upon retirement from the Presidency, shall become an Honorary Member of the Board with voting powers. The Parliamentarian is nominated from among these members should the position become vacant. The privileges of Honorary Board Membership shall be granted to any Chapter members who are members of the National Board and/Region Board during their incumbency on those Boards. At the Annual Meeting of the Chapter, a Nominating Committee of five, including a designated Chair, shall be selected to serve until the close of the next Annual Meeting. Of the five, one shall be a member of the outgoing Nominating Committee, two shall be members of the Board, and two chosen from the general membership. At each Annual Meeting, the Nominating Committee shall present a candidate for each position to be filled at the Annual Meeting. Except as provided in this section with respect to one member of the outgoing Committee, no member shall be selected to serve for more than two consecutive years as a member of the Nominating Committee, and no person shall serve as Chair for more than two consecutive years. Recommendations for nominations may be made to the Nominating Committee by members of the Board and Chapter. The list of nominees prepared by the Nominating Committee shall be presented to the Board for its information and shall be sent in writing to all members of the Chapter with notice of the Annual Meeting. It shall be presented at the Annual Meeting for vote of the Membership. Nominations may be made from the floor at the time at which the Nominating Committee presents the official slate. The names of any member so nominated shall be included in the slate if such nominees accept such nominations. Election by ballot shall be held for each position for which there is more than one candidate; otherwise, the Secretary may be instructed to cast one ballot, if so voted. A vacancy in an elective position shall be filled for the balance of the fiscal year by the Executive Board. The Nominating Committee then ratifies this action and this action is posted in the bulletin. The President shall preside at all meetings of the Chapter and of the Executive Board; shall have general supervision and direction of the affairs of the Chapter; shall appoint all Chairs of Standing Committees (except the Chair of the Nominating Committee, who is elected), and the Chairs and members of all Special Committees except as otherwise provided in these Bylaws. The President shall be co-signer with the Treasurer on checks and shall perform all duties generally vested in the office of the President, as specified in these Bylaws, or in any vote of the Executive Board. The Vice President(s), as designated by the President, shall perform the duties of the President in the President’s absence or inability to serve. The Vice President(s) shall perform such other functions as may be assigned by the President or the Executive Board. A designated Vice President shall serve as co-signer of checks in place of the President, should the need arise. The Secretary shall keep a record of the meetings of the Chapter and of the Executive Board and shall perform such other functions as may be specified by the Board. The Secretary will maintain all correspondence of the Chapter and Board not handled by other Officers or Chairs. Notices of meetings of the Chapter and of the Board shall be issued by the Secretary or another person if designated by the President. The Treasurer shall have the custody of the funds of the Chapter, and shall deposit same in the name of the Chapter in a bank determined by the University; shall keep an accurate record of all moneys collected and expended; and shall transmit funds to the National Center on a monthly basis. The Treasurer shall follow such accounting practices and employ such forms and vouchers as the BNC shall specify or supply from time to time; shall pay bills only upon approval of the President; and shall present a Treasurer’s statement at each meeting of the Board. to inform the President of errors in Parliamentary procedure if they affect the basic rights of members. to give advice to members during times when there is not a meeting in process. There shall be an Executive Board consisting of the elected Officers, President, Vice President(s), Treasurer, Secretary, Parliamentarian, and the previous President of the Desert Chapter. The Board shall have the authority and control of the affairs of the Chapter between meetings of the Chapter, but no action shall conflict with any action of the Chapter. Regular meetings of the Board shall be held monthly from September to May inclusive, by call of the President upon at least one week’s notice. The time and place of meetings shall be determined by vote of the Board. Special meetings of the Board may be held at the call of the President, and shall be held upon the written request of five or more members of the Board. 50% of the members of the Board shall constitute a quorum. Any member of the Board who fails to attend three consecutive meetings without a reasonable excuse shall forfeit membership on the Board after due notice. There should be a minimum of two meetings of the Chapter each year, including a Annual Meeting, at such time and place as may be determined by the Executive Board. The Annual Meeting shall be held in the spring unless otherwise designated by the Board. In addition, a General Meeting shall be held in the month of February. Special Meetings of the Chapter may be called by the President upon a vote of the Executive Board. Notice of meetings of the Chapter shall be issued via internet mail, internet bulletin, or posted on the chapter web site at least two weeks before the meetings. At any meeting of the Chapter, ten members, including officers, shall constitute a quorum. There shall be such Standing Committees as are necessary to carry out the program of the BNC and the Chapter. Committees shall be established and may be dissolved by vote of the Executive Board. The President shall appoint the Chair of each Standing Committee (except the Chair of the Nominating Committee, who is elected). These appointments may include Chairs, not to exceed five, who are not already members of the Board by election. The Chair of each Standing Committee (except the Nominating Committee), in consultation with the President or coordinating Vice President, shall appoint the members of the Committee. Committee appointments are for one year, but Chairs and Committee members may be reappointed. Special Committees may be established by the Executive Board; members of such committees including the Chairs are to be appointed by the President. The accredited delegate to a Conference of the BNC shall be the Chapter President or designated alternate. Said alternate shall be a Vice President or another Officer or Member of the Chapter Board, elected by the Executive Board on nomination by the Nominating Committee. Section 2. ADDITIONAL DELEGATE(S) OR ALTERNATE(S) Additional delegate(s) or alternate(s), meeting the requirements of the Rules of Association of the BNC, shall be elected by the Executive Board on nomination by the Nominating Committee. The rules contained in “Robert’s Rules of Order Newly Revised” shall govern in all cases to which they are applicable and in which they are not inconsistent with these Bylaws or the Rules of Association of the BNC. These Bylaws may be amended by a two-thirds vote of the members present and voting at any general meeting of the Chapter, provided that a copy of the proposed amendments has been posted on the web site at least two weeks before said meeting, and provided that prior to said meeting such proposed amendments have been approved at a meeting of the Executive Board, and provided further that no amendment shall conflict with the Rules of Association of the BNC or of the University.